Admittedly, I am an etymological geek. I am particularly fascinated by the origins of the vocabulary of science, medicine, and especially of nature. For example, the plant family name, Geraniaceae, shares a connection with ornithology. Three of the largest genera of this family have avian names of Greek origin: Geranium (geranos---crane); Pelargonium (pelargos---stork); and Erodium (erodios---heron). The family and these genera are so named because the fruit resembles a cluster of hungry baby birds with their long beaks turned upward as if requesting to be fed. 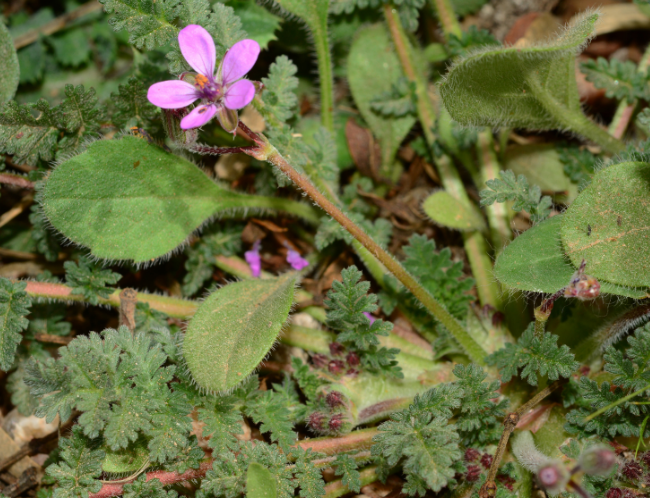 Erodium cicutarium, a common “weed,” is called by several common names: stork’s bill, red stem stork’s bill, heron’s bill, filaree, alfilaria, and pin clover are but a few. The tiny pink/purple flowers appear in late winter and early spring growing from a low, leafy rosette. Filaree is common in disturbed areas, fields, and yards. These early flowers are an important early season nectar and pollen source for numerous pollinators and other insects. At maturity, the beaked schizocarp-type fruit of Erodium splits into five single-seeded sections, each bearing a coiled appendage, or awn. The seed’s awn functions as a hygroscopic spring. As the humidity in the air decreases, the awn begins to spirally coil, breaking the seed away from the rest of the fruit. The coiling of the spring allows the seed to be explosively dispersed from the parent plant. While on the ground, an increase in humidity will cause the seed’s awn to unwind, but upon drying, the awn will coil again for the seed to drill itself into the ground. Water, ants, and clinging to animal fur or feathers are other ways for filaree seeds to be dispersed. Filaree is believed to be one of the earliest Eurasian plants to be brought to North America. It was probably introduced to California by Spanish explorers in the early 1700s as forage for their cattle, but it quickly spread to become naturalized in the deserts and arid grasslands of the Southwest, but it is also widespread across North America. Filaree is used as a food plant by some insects and numerous species of wildlife. It is also edible for humans, either eaten raw or as a cooked vegetable. It has a high protein, mineral, vitamin, and antioxidant content. The Blackfeet and Shoshone included it in their diet. There is a colorful historical resume attached to filaree as a medicinal plant. Various parts of the plant have antibacterial, antifungal, antiviral, anti-inflammatory, anti-diarrheal, diuretic, astringent, and analgesic properties. An old folk remedy in Europe used filaree to relieve water retention and to treat dysentery. In America, the Ohlone of the northern California coast drank a leaf tea for typhoid. Nursing mothers of Jemez Pueblo ate the roots to increase lactation. The Navajo made a poultice to treat animal bites and infected wounds, and the Zuni chewed the roots and applied the mash on sores and rashes and drank root tea for stomach aches. Sometimes big things do come in small packages!